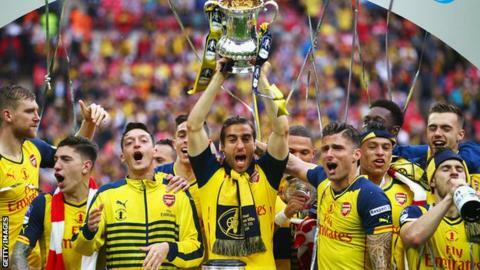 Arsenal say they are "strongly opposed" to the formation of a breakaway European super league. Speculation regarding a new league came after Tuesday's meeting of officials from the Gunners and Premier League rivals Chelsea, Liverpool, Manchester City and Manchester United. A representative from the International Champions Cup series was also involved. An Arsenal spokesman said: "Discussions were primarily around the ICC and formats of European competitions." The ICC involves matches between several high-profile European clubs played, predominantly, as pre-season tournaments worldwide. Any impetus for a breakaway league is believed to come from clubs in mainland Europe due to the current financial strength of the Premier League. "Not Arsenal, nor any clubs at the meeting, are seeking changes to the Premier League and European landscape and no conversations surrounding displacing the Premier League or starting a European super league took place," added the Arsenal spokesman. Uefa, European football's governing body, said it had no concrete proposals to change the format of its European competitions, but was constantly reviewing the situation. "We have just gone into a new three-year cycle for Champions League and Europa League, so we cannot offer any further comment at this stage," said a Uefa spokesman. The Premier League's new broadcasting deals, worth more than £8bn in total and due to take effect from the beginning of the 2016-2017 season, will dwarf the current financial rewards on offer for a successful European campaign.